Couples and individuals who use in vitro fertilization (IVF) for family building sometimes create more embryos then they will use in their family building process. During the IVF process, fresh embryos are transferred into a woman’s uterus via an embryo transfer procedure in hope of achieving pregnancy. Any remaining viable embryos are cryopreserved for future family building attempts by the creators. However, often times couples who have used IVF to achieve pregnancy have completed their families and still have embryos frozen in storage. Families with remaining frozen embryos have four disposition choices available to them. The family can keep the remaining embryos frozen. Couples who choose to keep their embryos frozen may not be done with their family building or may be facing unexpected personal issues that make it easier to simply keep them frozen. No ‘shelf-life’ has been determined for frozen embryos. Children have been born from embryos. Children have been born from embryos that have been cryogenically frozen for more than 12 years. You will pay annual storage fees to your clinic or your clinic may move your embryos off-site for long term storage at a cryobank. Families can release remaining embryos to scientific research. Frozen embryos are used by scientists for experiments; including embryonic stem cell research. Talk to your physician to understand the qualification process and available programs. Families can dispose of the remaining embryos. 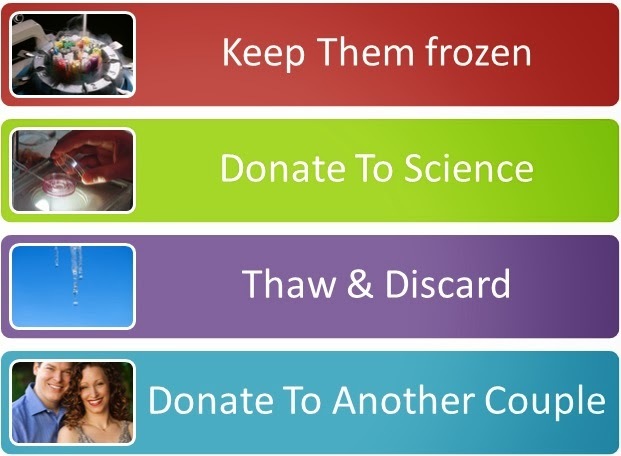 You may choose to discard your remaining embryos. Your clinic can explain their policies and procedures regarding this choice. Finally, a family can donate their embryos for attempted pregnancy and childbirth. Some patients choose to donate their embryos to another infertile couple who would like to build their family. The donation process can be anonymous or you may choose the family who receives your embryos. Several agencies and clinics have programs to assist you. To learn more about embryo donation please visit EmbryoAdoption.org.